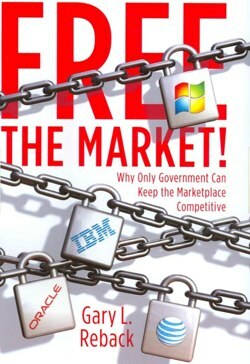 I recently finished reading Free the Market: Why Only Government Can Keep the Marketplace Competitive, a new book by noted antitrust agitator Gary L. Reback. Unsurprisingly, Reback, who led the antitrust jihad against Microsoft during the 1990s, has written a book that reads like an extended love letter to antitrust law. This man loves antitrust the way teenage girls love the Jonas Brothers — gushing, teary-eyed, ‘I-would-just-die-for-you’ sort of love. In Reback’s world, antitrust seemingly has no costs, no downsides, no trade-offs. It is our salvation and he serves as its high prophet. Everything good that happened in the world of high-tech over the past few decades? Oh, you can thank Almighty Antitrust for that. Anything bad that happened? Well, then, clearly there just wasn’t enough antitrust enforcement! That’s this book in a nutshell. Think I’m kidding? How about this gem of quote from pg. 247: “Antitrust enforcement spawned Silicon Valley’s software industry as well.” Wow, who knew! Of course, that’s utter poppycock and should be somewhat insulting to the many entrepreneurial men and women in the high-tech world who risked everything in an attempt to build a better mousetrap. In Reback’s view of things, however, none of those mousetraps would have ever gotten built without antitrust there to supposedly shelter them from wicked “monopolists” (read: any large company) already operating in the marketplace. I’m sure many in Silicon Valley will also be surprised to hear Reback’s assertion that, “On closer examination, the Valley looks like one big public welfare project.” (p. 54) Ah yes, the old myth that government gave us the Net we know and love today. Please. Like many others, Reback spins a revisionist history of how early ARPANET involvement and seed money somehow made the Internet great when, in reality, the Net was stuck in the digital dark ages until it was finally allowed to be commercialized in 1992. What irks me most about this book, however, is Reback’s perpetuation of the myth that antitrust is somehow not a form of economic regulation. I hear this tired old argument trotted out time and time again, even by many conservatives. Reback says, for example, that “Antitrust sets the rules of the road, so to speak, but doesn’t tell people where to drive.” By contrast, he argues, “Advocates of regulation want continuing government oversight and rule making to produce what would be the beneficial results of a free market… Neither approach works all the time, and decided between them remains difficult.” (p. 19) Again, this “choice” is largely a fiction since, for many industries, we end up getting both! Antitrust law is a form of economic regulation. And like all economic regulation, it transfers wealth, often in response to special-interest urging… [I]n antitrust cases, the targeted companies’ rivals have a direct financial, as opposed to ethical, interest in the outcome. Assertions that antitrust law is in the public interest do not change the fact that the private motives of rivals, and even ambitious enforcers, are always lurking in the background. An antitrust decree may be even counterproductive by establishing an inefficient market structure… A decree may also be ineffective because the government and the court fail to anticipate changes in technology or customer demand. .. The ongoing costs of enforcing antitrust decrees can be very large. If an industry is changing rapidly, structural remedies may be difficult to enforce… Most of the antitrust decrees in the leading cases analyzed below continued in effect for many years, even decades. In many cases, these decrees required the continual supervision by the lower court and often led to appeals to the higher courts. So much for antitrust supposedly not being a form of economic regulation and not having substantial costs. Moreover, after surveying 95 major Section 2 Sherman Act cases won by the government or ending in consent decrees, Crandall concluded that there was “remarkably little evidence that these cases and the relief that emanated from them had a positive effect on competition and consumer welfare.” Gary Reback is unmoved by such evidence, however. Instead, he just builds his narrative on the old myth of the robber barons that so many antitrust crusaders rely on, and which has long-since been discredited by serious economic historians. Again, no mention here of the deadweight loss to society associated with years and years of legal wrangling that accompanies such lawsuits. Reback just sweeps all that under the rug — and why wouldn’t he as an antitrust lawyer! But those costs on the economy and innovation are real. There’s also no serious mention of how antitrust law has all too often been used as weapon by disgruntled marketplace competitors to hobble rivals using such legal tactics. Reback gives the same lip service to antitrust being about “protecting consumers” as many other defenders do, but all too often his book — like antitrust law itself — sounds more like a defense of certain companies, industry sectors, or old ways of doing business. Oh, and the earlier antitrust intervention and litigation comes the better! That’s another favorite of Reback and the antitrust bar. Referring specifically to the Microsoft case, Reback argues that, “government intervention at an early stage of market development was less intrusive and more beneficial than waiting for a bad problem to get worse.” (p. 185) Where does one draw the line in terms of how early might be too early to intervene? Reback never makes it clear because, as with so much else in the world of antitrust, it’s all an arbitrary guessing game. We’ll let unelected bureaucrats and judges make those judgment calls and engage in a preemptive strike to establish a sensible industrial policy competition policy for high-tech markets. After all, it’s not like these markets are fast-moving and prone to sudden disruptive change or anything! are ultimately better addressed by voluntary, spontaneous, bottom-up, marketplace responses than by coerced, top-down, governmental solutions. Moreover, the decisive advantage of the market-driven approach to correcting [market] failure comes down to the rapidity and nimbleness of those response(s). Let’s give those other forces — alternative platforms, new innovators, social norms, public pressure, etc. — a chance to work some magic. Evolution happens, if you let it. Moreover, if you are always running around crying “market failure!” and calling in the code cops, it creates perverse marketplace incentives by discouraging efforts to innovate or “route around” bad code or code failure. We don’t want the whole world sitting around waiting for government to regulate the mousetrap to improve it or even give everyone better access to it; we should want the world to be innovating to create better mousetraps! [But] one need not believe that the markets… are “perfectly competitive” to accept that they are “competitive enough” — or at least, better than regulatory alternatives. The 13-year investigation, which required IBM to retain 200 attorneys at one point, fizzled in the early ’80s as the computing landscape shifted from mainframes to personal computers. The government abandoned the tainted effort entirely in 1982, as clones of the IBM PC eroded Big Blue’s dominance. But the company, still fearful of the watchful eye of the Justice Department, took pains to avoid the appearance of a monopoly long after it relinquished its hold on the market. People who worked for IBM in the ’80s and early ’90s said the company routinely fell victim to “pricing death strategy”–a reluctance to lower prices below cost, even on products that weren’t selling–to avoid what the government would call predatory pricing. By the mid-’80s, the company was in bad shape. The antitrust troubles, combined with ill-timed product failures such as the Future System, pinched revenues. The company began a nearly decade-long financial slide. In retrospect, the antitrust case against IBM seemed laughable. [T]he parties destined to become players in the PC revolution were unknown when the PC was introduced, and the experts’ predictions of a much-ballyhooed computer face-off between IBM and AT&T never materialized. Innovative companies that did not exist at the beginning of the revolution rose rapidly. Few people had ever heard of a small company named Microsoft. Nor had they heard of Intel, Novell, Compaq, Dell, or Netscape. A dominant firm can lose its “King of the Hill” status in two ways. First, if it does not continually improve, it will lose market share and profits to low-cost imitators. For example, the ability of low-end PC manufacturers to make IBM clones fostered robust price competition in the PC market. Second, today’s market leaders must worry that some established and well-financed competitor or possibly an upstart produce a technical breakthrough that will displace them. This situation reflects [the] fact that gains from innovation are so powerful and beneficial to consumers that they outweigh the higher prices dominant firms can charge. Indeed, attempts to eliminate these high profits by regulating prices would almost certainly disserve consumers even if the regulations dampened the incentives for innovation only slightly. What Pitsch is talking about here is dynamic competition, not the static competition, fixed-pie mentality that Gary Reback and so many antitrust defenders espouse. Those of us who believe in dynamic competition see markets in a constant state of flux and expect that sub-optimal market developments or configurations are exactly the spark that incentivizes new form of market entry, innovation, price competition, and so on. But the static competition crowd looks at the same situation outlined above and imagines that the only hope is to wheel in the wrecking ball of antitrust regulation. Indeed, such dynamic thinking is completely alien — even outlandish — to passionate antitrust supporters like Reback. Nonetheless, the last 30 or 40 years of economic literature on antitrust — and the work of “Chicago School” economists in particular — has illustrated that antitrust is not the pro-consumer nirvana that Reback makes it out to be. But Reback considers just about everything the Chicago School taught us to be antitrust apostasy and he would like to erase four decades worth of economic literature and evidence that suggests antitrust law is a form of economic regulation and does have unintended consequences that often hurt consumer welfare. His fairy tale narrative of antitrust as the savior of capitalism is utter rubbish, and his recommendations to expand antitrust enforcement wouldn’t “Free the Market” as he argues in his book’s shameful title, but would instead wrap it in chains. In closing, I would just like to encourage everyone to go out right now and read R.W. Grant’s classic story about the madness of antitrust, “Tom Smith and His Incredible Bread Machine.” Or, if you want a more serious treatment of the issue, then I highly recommend Dominick T. Armentano’s, Antitrust and Monopoly: Anatomy of a Policy Failure. Oh, and just for kicks, you might want to read this Wall Street Journal story from earlier this week about how antitrust officials are being pressed by dairy farmers to open an antitrust investigation because some of them believe consolidation is responsible for the fact that milk prices have dropped 36% recently, the lowest level in three decades. Only deep in the story do you read that: “Consumers are benefiting. The federal Bureau of Labor Statistics said in its monthly Consumer Price Index report released Wednesday that retail dairy prices in August were 10.4% lower than they were a year ago.” Of course, once you realize that antitrust is more about protecting companies than protecting consumers you are not surprised that such information becomes an afterthought.